Boasting 5,000 miles of stunning coastline and surrounded almost entirely by four sapphire seas, Italy is a prime destination for beach and water vacations. Whether one wants to relax in a lounge chair on any of the country’s hundreds of sandy beaches, or prefers scuba diving beneath the surface of the waves to explore sea life and hidden grottos, Italy offers a wealth of locales to enjoy. For surfers, swimmers, boating enthusiasts, or beach lovers – there is a picturesque seaside escape waiting on the water’s edge of Italy. Everyone from first time snorkelers to experienced divers will enjoy the many oceanic wonders provided off Italy’s coast. Teeming with ocean life, world-class reefs, and crystal-clear waters, Italy is an aquatic paradise. Located in the region of Calabria is Capo Vaticano – a dream diving destination. The water is completely transparent, allowing for snorkelers and divers the chance to view the area’s many species of fish. After exploring the abandoned coves, take a break in Tropea, a nearby fishing town that is as historic as it is charming. Located in the Tyrrhenian Sea off the coast of Sicily are the Aeolian Islands – a volcanic archipelago that is a top destination for snorkelers and scuba divers from all over the world. The most popular of the islands is Panarea – famous for its whitewashed villages and one-of-a-kind views. Scuba divers flock to Panarea for its abundant sea life and less crowded waters. For snorkelers, a must-see is the Emerald Coast of Sardinia. Aptly named, its blue-green waters are the main draw, among the white sand beaches and countless coves. A choice destination on the coast is Santa Teresa di Gallura – a town bursting with character and seaside views. To gaze upon panoramic views and unique archeological artifacts, travel to the Tuscan Archipelago. Made up of seven islands, this archipelago features spots perfect for enjoying underwater activities. Beneath the surface, one will find a variety of fish – including sunfish and swordfish – as well as unique red corals. Arguably Italy’s most famous and highly-traveled coastal locale, Campania features some of the country’s best tourist spots – including the enchanting Amalfi Coast and famed Isle of Capri. But this region features much more than its trademark cliffside views and elegant resorts. The journey from land to sea when snorkeling or scuba diving Amalfi promises to redefine one’s views on Campania. The abundance of sea life, quality waters, and endless hidden gems to discover make it a must-see. The most unique feature of snorkeling or scuba diving the Amalfi coast are the vast number of coves, caves, and grottos. The rocks of the Mediterranean are quite calcified, making the area rife with aquatic cavities tucked away in the sea, just waiting to be discovered. 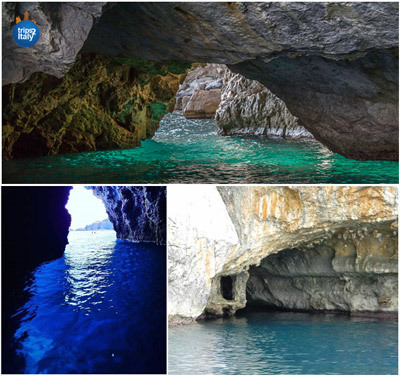 Grotta Azzurra (Blue Grotto) – Known for its blue tinted water and silver light refractions inside. Grotta d'Argento (Silver Grotto) – Known for its stalagmites and the silver reflections inside. Grotta del Sangue (Blood Grotto) – Named for the red color the minerals produce on its walls. Cala della Lanterna (Lantern Cove) – A majestic cliff featuring a lighthouse with a beautiful grotto at the bottom. Whether looking to rent a boat and navigate the Italian waters on one’s own or wanting to take a guided boat tour, Italy’s thousands of miles of coastline offer wonderful opportunities to set sail. In the Gulf of Naples are the Phlegraean Islands, an archipelago consisting of four islands – Ischia, Procida, Vivara, and Nisida. They are the perfect setting for boating and sailing because of their nearness to the Isle of Capri and the amazing views of Naples they offer. 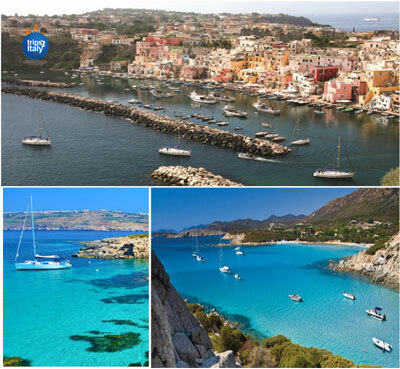 In Lazio is a group of six islands called the Pontine Islands – the most well-known of which are Ponza and Ventonene. These islands can only be reached by boat, but the trip is well worth it, as they offer perfect waters and photo-worthy coastlines, such as the amphitheater shaped Chiaia di Luna. Another popular area for boats in Italy is the Maddalena Archipelago in Sardinia. Sailors from all over the Mediterranean travel to spend time on the islands, bouncing from islet to islet and enjoying the riches of the area. The most stunning and unique beach to visit here is the Spiaggia Rosa (Pink Beach) on Budelli island. Bits of coral, crystal, and microscopic organisms give this beach’s sand a one-of-a-kind rose hue. For those passionate about all things nautical, a visit to Trieste is a must. A historic seaport, it is one of the Mediterranean’s most well-known areas. It hosts the annual Barcolana Regatta in its gulf, solidifying this spot as a hub for boating culture. 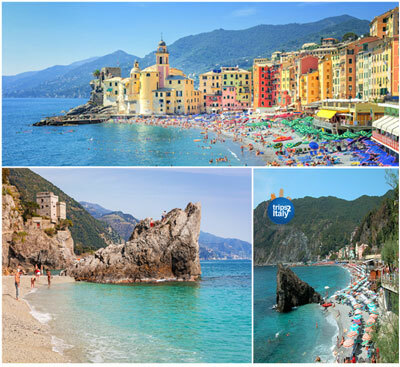 One of the most talked-about areas of Italy’s coast, the Italian Riviera is a romantic and elegant coastal location. With iconic destinations such as the fishing villages of Cinque Terre, the luxury and decadence of Portofino, and smaller – but no less outstanding – towns of Sanremo and Santa Mergherita Ligure, the Italian Riviera is an ideal place to enjoy views from the water. Located in the region of Lombardy is a collection of stunning lakes that offers visitors the opportunity to see unique coastlines filled with elegant villas, ancient castles, and local villages. Enjoy a boat trip on any of the region’s spectacular lakes – Garda, Maggiore, or Como – which promise views of historic locations and gorgeous natural landscapes. The unique geography of Italy’s peninsula means that the seas which surround the nation are subjected to swells from nearly all directions. While the Mediterranean isn’t known to experience large or consistent wave patterns, winter weather conditions and winds in certain locations help bring more surf-worthy swells to the coastline. When the weather is right, the coastline offers surfers the chance to surf great waves while experiencing the views, atmosphere, and culture that Italy is famous for. The top surf spots in Italy include Serapo Beach in Campania, Arenzano Lido in Liguria, and the Piombino and Leghorn coastlines in Tuscany. With so many hundreds of miles of coastline and such a variety of large lakes, Italy allows those interested in water sports opportunities to enjoy all kinds of activities, including windsurfing and water skiing. In the Lake District of Italy on Lakes Como and Garda, travelers can enjoy active water sports on nature’s gym floor. Lake Como’s natural landscape – featuring mountain peaks and valleys – as well as its abundant sunshine makes it ideal for water sports. 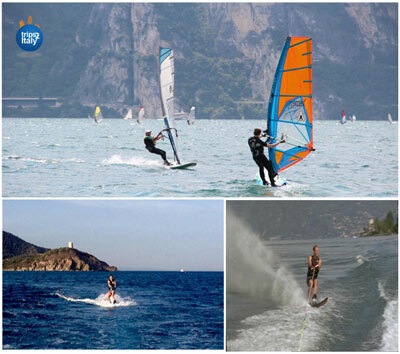 Lake Garda is home to the windsurfing capital - Torbole, which has hosted many windsurfing championships. 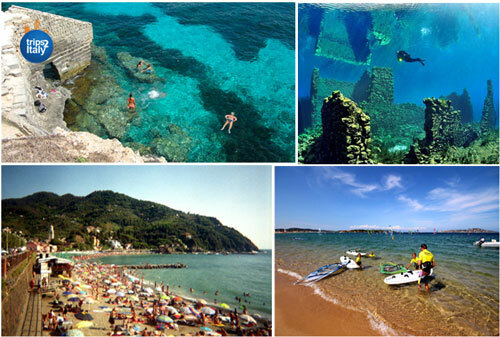 Vieste, located right on the heel of Italy’s boot, is great for water sports as well. Thanks to its calm waters, this charming seaside town makes for an ideal location to enjoy waterskiing, jetskiing, or windsurfing. One of Italy’s best windsurfing spots is Porto Pollo. With clean beaches and clear waters, this town in Sardinia has captivated windsurfers for decades, serving as a training ground for many professionals. It even features the Sporting Club Sardinia, a Royal Yachting Club Recognized Training Center. If water sports, diving, and boating is not one’s cup of tea, feel free to pack the itinerary with beach destinations that allow for relaxation, play, and socializing in the sun. With hundreds of beaches along its coastline to choose from, Italy has been a top choice for beach vacations to everyone from royalty, to celebrities, even local Italians. Some of the best beaches in Italy can be found in the country’s most popular regions. In Liguria is the famed Italian Riviera. Options here range from the busier beach of Monterosso to the rocky beach and cliffside trails of Riomaggiore. Along Sardinia’s emerald coast, miles of beach coastline await, including beaches such as Su Tiriarzu and Spiaggia del Principe. In Tuscany, enjoy white shores and charming villages in locales like Castiglione della Pescaia and Monte Argentario. Sicily boasts a variety of beaches, including the popular Mondello Lido to the exotic black sand beaches on the Aeolian Islands. Other regions of Italy – including Lazio, Campania, Calabria, and Apulia – all offer their own beaches to the mix, adding to the sheer volume of choices one has when planning an Italian beach vacation. Nearly 200 beaches in Italy have earned the award, giving travelers a huge variety of exceptional beaches to choose from. However, don’t be turned off if a beach has not yet earned the Blue Flag Award. The coastal destinations throughout Italy are among the best in the world, offering pristine waters, soft sand, and views unlike any other. Even if one’s vacation is not fully beach or water focused, a few of Italy’s incredible coastal locales can be worked into existing itineraries for day trips. Because the majority of Italy is surrounded by water, even travelers to the big three – Rome, Venice, and Florence – can jet off to enjoy a few days of beach or water activities if they’ve got more time to explore. If visiting Rome, take a break from sightseeing to enjoy Santa Marinella, a beach that is a 45-minute train ride away. Even Florence offers easily accessible beaches like Viareggio or Castiglioncello within the region of Tuscany. Travelers in Venice can enjoy Lido, a beach located an hour away, featuring soft, white sand and blue waters. There is no shortage of amazing destinations when planning beach and water focused trips to Italy.